A private bus fell into a deep gorge in Uttarakhand’s Pauri district on Sunday morning killing at least 48 people and injuring 10 others, police said. The “overloaded” bus was carrying 58 passengers, they said. 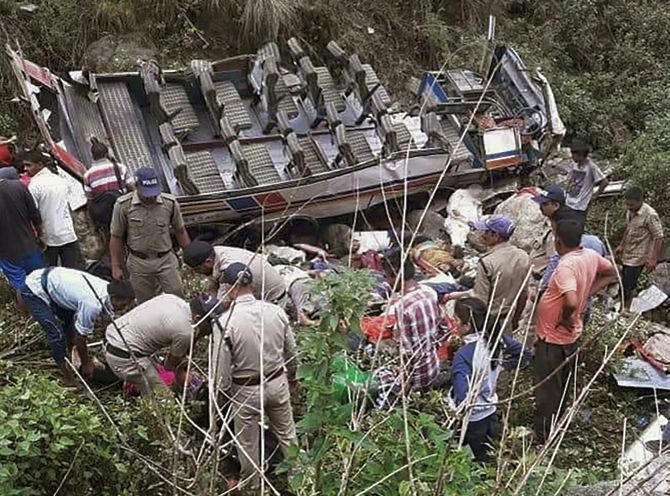 “The accident occurred near Gween village, close to Dhumakot, when the bus on way to Ramnagar fell into a 200 metre deep gorge killing 45 persons on the spot and leaving 13 injured,” Pauri Superintendent of Police Jagat Ram Joshi said on the phone. The accident took place around 8.30 am, he said. Three more succumbed to injuries later during the day at the PHC, Dhumakot, where the injured were rushed after rescue teams reached the spot, Joshi said. Two critically injured were referred to Ramnagar while eight were under treatment at Dhumakot, the SP said. Though the exact cause of the accident was not yet known, the bus was carrying passengers much beyond its capacity, he said. One of the possibilities is that the bus fell into the gorge when the driver was trying to negotiate a big waterlogged pothole in the middle of the road, the official said referring to initial inputs. The plunge was so forceful that the upper part of the bus separated exposing the seats in the lower part, the SP said. All bodies were recovered and the injured rescued from the mangled remains of the vehicle which rolled down into the 200 metre deep gorge before crashing into a shallow stream, he said. Rescue operations were carried out by the police and the State Disaster Response Force personnel, he said. Chief Minister Trivendra Singh Rawat visited the accident site and expressed grief at the loss of lives. He ordered a magisterial probe into the accident besides announcing a compensation of Rs 2 lakh to the next of kin of those killed and Rs 50,000 for the injured, the CMO said. Prime Minister Narendra Modi also conveyed his condolences to the families of those killed in the accident. Earlier, Union Home Minister Rajnath Singh spoke to Chief Minister Rawat on the phone to condole the deaths in the accident and offered all possible help in relief and rescue operations.